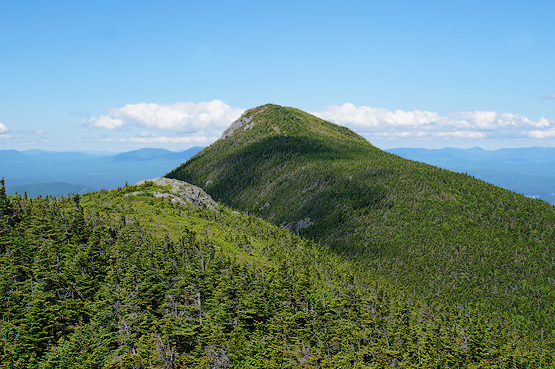 The Bigelows are a mountain in the Bigelow Range in Franklin County, Maine. The mountain is named after Major Timothy Bigelow who climbed the rugged summit in 1775 for observation purposes. The majority of the mountain is part of the over 10,000 acre Bigelow Preserve created in 1976. Bigelow Mountain is a long mountain ridge with several summits including Avery Peak (Myron H. Avery), West Peak at 4,145 feet, The Horns at 3,805 feet, Cranberry Peak at 3,194 feet and Little Bigelow Mountain at roughly 3,070 feet. 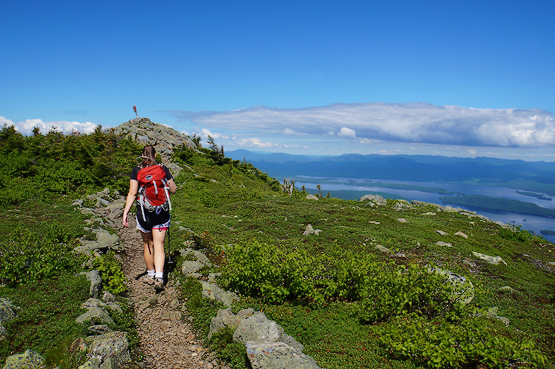 The Appalachian Trail, which spans from Georgia to Maine, traverses the mountain. Bigelow West from Bigelow Avery - June 22, 2014. The map below shows how to get to the summit of Mount Bigelow south Horn as well as, Mount Bigelow West Peak, and Mount Bigelow, Avery Peak. Begin from the Stratton Brook parking area on Stratton Brook Pond Road. Follow the dirt road for roughly half a mile (mileage is unmarked on most maps), until you reach the Stratton Brook campsite. From here, follow the Fire Warden's Trail for 4.6 miles (at the 1.6 mile mark, you will come to a junction with the Horns Pond Trail that you will stay left at). After the 4.6 miles, you will be at the Avery Col campsite. 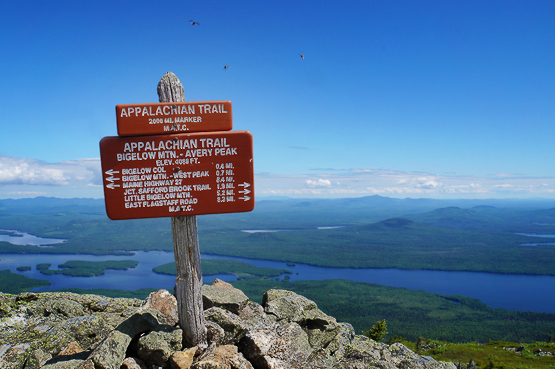 To summit Avery Peak, head right on the Appalachian Trail for 0.4 miles. After enjoying the views, head back down to the Avery Col Campsite junction. 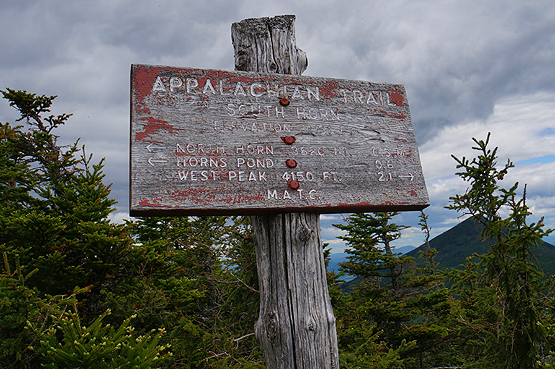 To head up to the West Peak, go left on the Appalachian Trail for 0.3 miles where you will reach the summit. 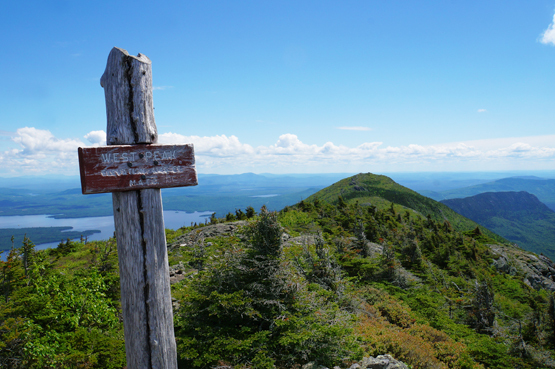 After enjoying the views here, you can choose to head back down to the parking area the same way you came up, or follow the directions below to summit South Horn (which is on the New England Hundred Highest list) as well. Continue over Bigelow West Peak on the Appalachian Trail for 1.8 miles to reach the summit of South Horn. To get back to the parking lot, continue straight over South Horn for 0.8 miles until you reach a junction with Horns Pond Trail and the Horns Pond lean-to shelter. Turn left onto the Horns Pond Trail. Hike for 2.4 miles until you reach the junction with the Fire Warden's Trail. Follow the Fire Warden's Trail down for 1.6 miles until you reach the Stratton Brook Campsite, and continue past on the dirt road for roughly half a mile until you reach the parking area. 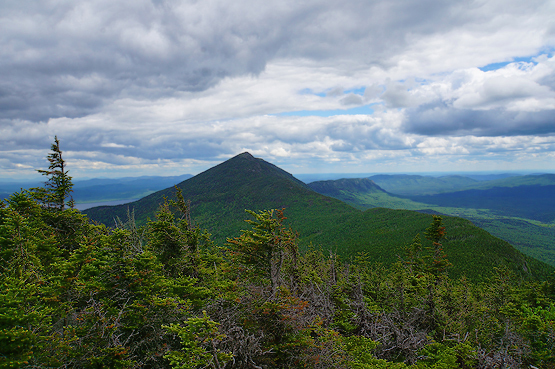 Looking at the summit of Bigelow West Peak from the South Horn summit - June 22, 2014. Summit sign of South Horn on June 22, 2014. Almost at the summit of Bigelow Avery Peak on June 22, 2014. 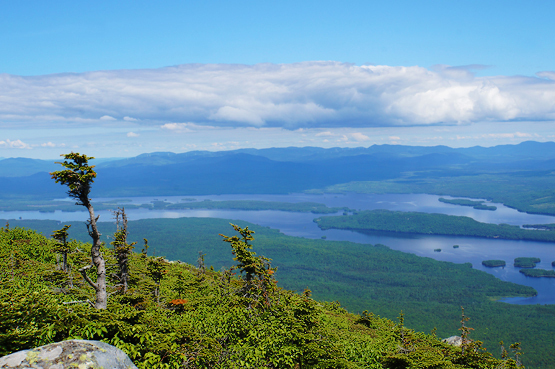 Views between Mount Bigelow West and Avery Peaks of Flagstaff Lake - June 22, 2014. 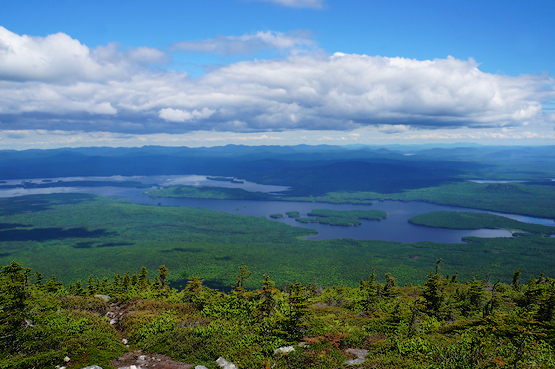 Almost at the summit of Bigelow Avery Peak on June 22, 2014 with Flagstaff Lake in the background. Summit of Bigelow, West Peak - June 22, 2014. If you are driving on Route 16 in Carrabassett Valley, Maine, drive West from the Sugarloaf USA Ski Resort entrance on the corner of Route 16 and Access Road) for 3.2 miles. 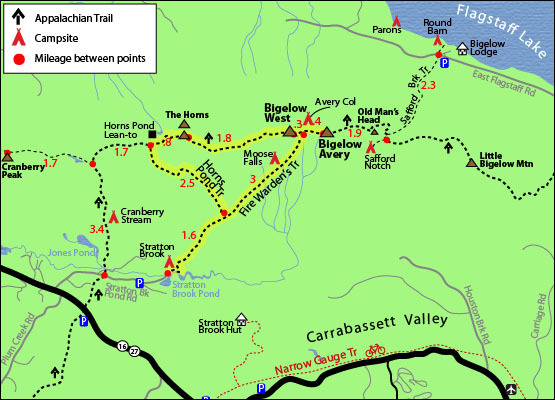 After passing a parking lot for the Appalachian Trail, you can take the 1st or 2nd right onto Stratton Brook Pond Road, or Pond Loop Road (they both join together less than a tenth of a mile in). Drive 1.5 miles until you reach a parking area. (0.8 miles into this road, you will reach the Appalachian Trail crossing.) The trail starts on the back left side of the lot as you drive in. (Note: you will pass one other parking lot on Stratton Brook Pond Road before reaching the one you want for the hike above).